A long time ago I wrote a blog post listing some web testing resources, tools and articles. This is definitely an area that seems to get more and more focus these days. As web applications get more and more critical the need to ensure both functionality and reliability under load gets more obvious. Selenium – “a portable software testing framework” according to Wikipedia. 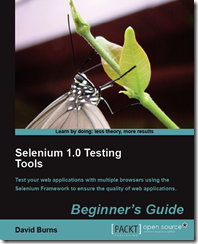 Selenium is not a tool set I have used at all but this certainly looks like a comprehensive and clearly written introduction to it. There are plenty of screenshots where appropriate but it is not “all screenshots” in the way that some books are. It is quite clearly laid out with “What just happened"?” sections summarising points just explained, “Pop quiz(es)” at the end of each chapter. The writing style is quite casual and conversational making it easy to read. The publisher PACKT also have a huge range of other books, including many on testing topics.